Today I’m going to show you how to get in on America’s hottest real estate with zero fees and commissions. And you can buy from the convenience of your brokerage account. Simply by typing in a few stock tickers. Think about this “zero fee” thing for a moment: with the average realtor whacking clients with 6% in fees and commissions, we’re talking thousands of dollars of savings here! Instead of paying these commissions, you’ll be able to collect them as monthly or quarterly payouts (or dividends) to fund your retirement. Here’s what you need to do first. The fat rent checks from the properties we’re going to invest in (more on them below) will soon have you yielding double digits on your original buy. Hold for the long haul and you’re looking at triple-digit (and even quadruple-digit) gains to boot! Best of all, these exclusive addresses are already 90% full, so we’re not sending you out to post vacancy ads on Craigslist here. In fact, you won’t have to do anything at all. These steady income generators—I’m talking about housing for America’s exploding senior population, daycare centers in fast-growing cities, and apartments in ratchet-tight markets like San Francisco—come with their own top-notch property managers. All you have to do is collect the checks! I know this sounds too good to be true—and I’ll admit I’m having just a little bit of fun with you here. But what I’m about to show you really is something anyone can do in minutes. It starts with a common investment called a real estate investment trust. REITs are like regular stocks but with a twist (two, really). One is that they own or finance income-producing properties, like medical facilities, shopping malls and hotels. They’re pass-through businesses, collecting the rent, then sending most of the cash on to you. The second is that they don’t pay federal income tax, as long as they pay out 90% of their profits as dividends. The bottom line? 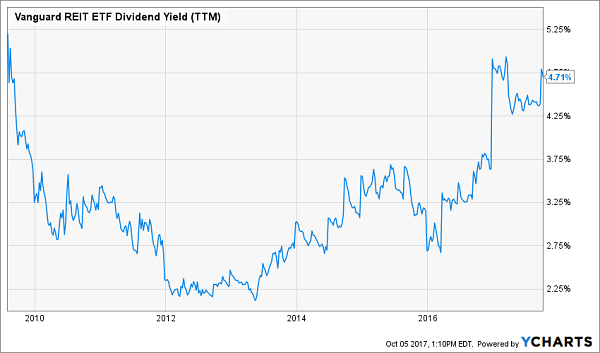 High dividend yields are a dime a dozen here. 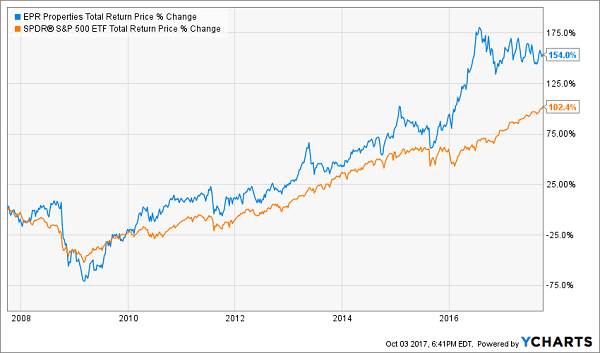 Take EPR Properties (EPR), which boasts a 5.8% yield, triple what you’d get from the average S&P 500 stock. It’s a dynamic REIT with 378 megaplex theaters, golf-entertainment complexes, ski resorts, charter schools and daycare centers across the country. I just recommended it in a September 25 article. But REITs like EPR are just the start. To make my “lazy landlord” plan work, you have to add my secret sauce: a dividend reinvestment plan, or DRIP. Dividend reinvestment is the Rodney Dangerfield of the stock world—it gets no respect. But ignoring its power is guaranteed to cost you thousands. I’ve got one word to describe this chart: lousy. It might even tempt you to quit stock picking altogether and go with an index fund like the SPDR S&P 500 ETF (SPY). 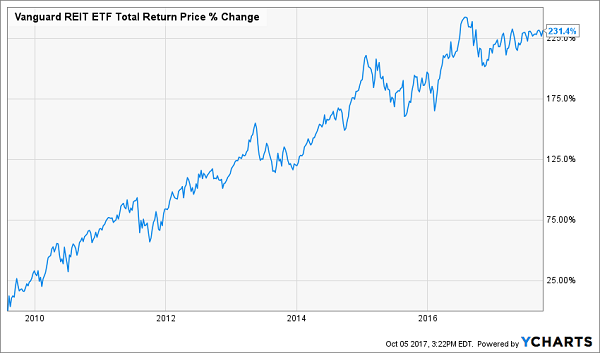 That’s right: reinvesting EPR’s gaudy 5.8% payout balloons its gain more than fivefold, putting it way ahead of the S&P 500’s total return. If that’s not an open-and-shut case for dividend reinvestment, I don’t know what is! EPR’s payout is also rock solid, taking up 82% of funds from operations (FFO, a better measure of REIT performance than earnings), more than manageable for a tightly run REIT like this one. And here’s another underappreciated benefit: EPR is a monthly dividend stock, so you can reinvest your cash faster. And the payout is growing like a weed, up 29% in the last four years! You can make your reinvestments even easier—and totally cost-free—with a DRIP, under which our REITs will automatically reinvest our payouts for us. As I mentioned off the top, you pay zero commissions on these buys. EPR’s DRIP, for example, lets you reinvest all or a portion of your payouts monthly, in line with its dividend frequency (including fractional shares). It also lets you buy stock directly from the company commission-free, subject to a $50 minimum and a $10,000 maximum. Not all companies have DRIPs, but that’s becoming less of a factor as brokerages offer their own, including versions that let you reinvest your payouts not only in the company they came from, but in any stock in your portfolio. No matter how you DRIP, it leads to a happy cycle: as you buy more shares, you generate higher dividend payments—which you use to buy more shares. Now lets move into AvalonBay Communities (AVB), a REIT with high-quality apartment complexes across America, from California to Massachusetts. That national diversification means it can resist a downturn in one area. Meantime, its concentration in places with population growth and high demand for housing (particularly California) boosted the stock over 500% in the last 20 years. 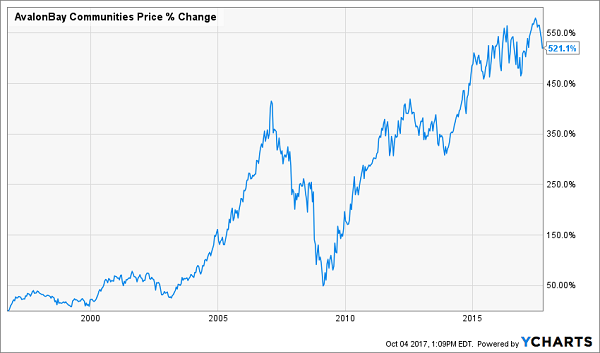 I haven’t even gotten to the dividend yet: it’s 3.2% now, but that’s just the beginning: the payout has exploded 255% in that two-decade time span. So if you bought AVB back in 1996, you’d be yielding an incredible 19.7% on your original buy today! And if you’re worried you’ve missed your chance here, don’t be. Now is a perfect time to buy AvalonBay, because millennials—prime tenants in AVB’s high-growth markets—are die-hard renters: homeownership among people 35 and younger has dropped 18% since 2006, according to the Pew Research Center. Even if that trend defies the odds and flips, the dividend is safe at just 65% of FFO. What’s more, management forecasts full-year core FFO of $8.50 to $8.70, way up from $8.19 in 2016. Finally, lets DRIP into Ventas (VTR), a REIT with 1,300 healthcare properties, more than half of which are devoted to seniors’ housing. That puts it in the middle of the biggest demographic trend in America—the retirement of the baby boomers, 10,000 of which are turning 65 every day. The best part? Overhyped Medicare and Medicaid worries have VTR trading at a nice discount—either through a one-time purchase or a DRIP—around 15 times forecast normalized 2017 FFO. For that, you’ll get a dividend that yields a tidy 4.8% and jumped 6% last December. With the payout eating up a low (for a REIT) 73% of trailing-twelve-month FFO, another hike looks like a lock just in time for Christmas 2017. A quick side note: Unlike AVB and EPR, Ventas doesn’t offer a DRIP—it suspended its plan in 2014—but that doesn’t stop you from reinvesting through your broker. Last Time REITs Did This They Spiked 232%! No matter how you buy your REITs, the time to get in on them is NOW. Because they’re blaring a dead-giveaway signal that they’re about to go on a HUGE run. Funny thing is, this ultra-reliable indicator is hiding in plain sight. 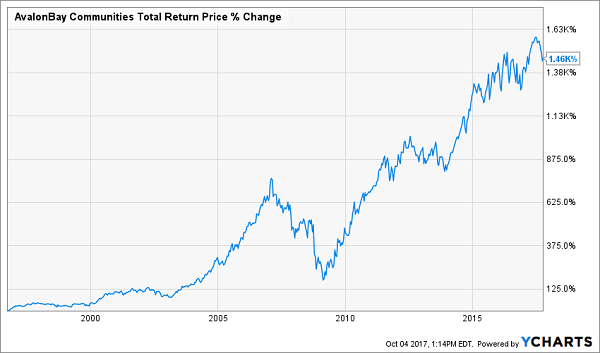 A 4.7% income stream is nice, but it gets way better when you consider that folks who bought back then—a mere 8 years ago—and dutifully reinvested their payouts are now sitting on a massive 231% return! All that just from a one-click buy of the Vanguard REIT ETF (VNQ). And now, just as night follows day, history is about to repeat. But we’re going to do even better than our lazy ETF investors with 2 other REITs I’m pounding the table on now. They already yield a fat 8% on average, so you’re getting a big head start right out of the gate here. My No. 1 REIT buy just hiked its dividend again—by 4% over last quarter’s payout. That marks this income wonder’s 20th consecutive quarterly hike! It pays an 8.1% yield today—but that leaps to an 8.5% forward yield when you consider we’ll see 4 MORE dividend increases in the next year. My No. 2 REIT buy is a 7.6% payer backed by an unstoppable trend that will deliver growing dividends for the next 30 years! That makes it recession proof, along with the fact that it pays a fat (and secure) 7.6% dividend and its payout hikes are actually accelerating! 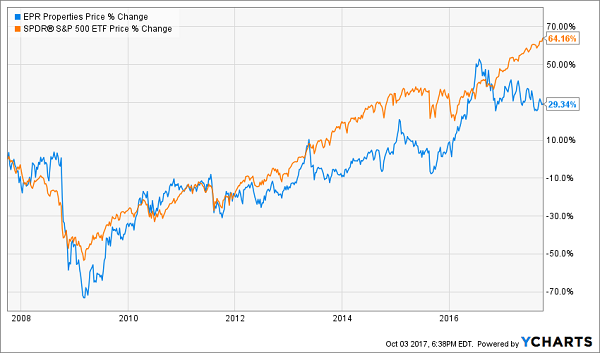 I’m ready to give you the full story on these 2 blockbuster REITs now. Just CLICK HERE to get instant access to their names, tickers and my complete research on each one.